350 East Cermak in Chicago is a key hub in the region's digital economy and one of the most connected buildings in the country. 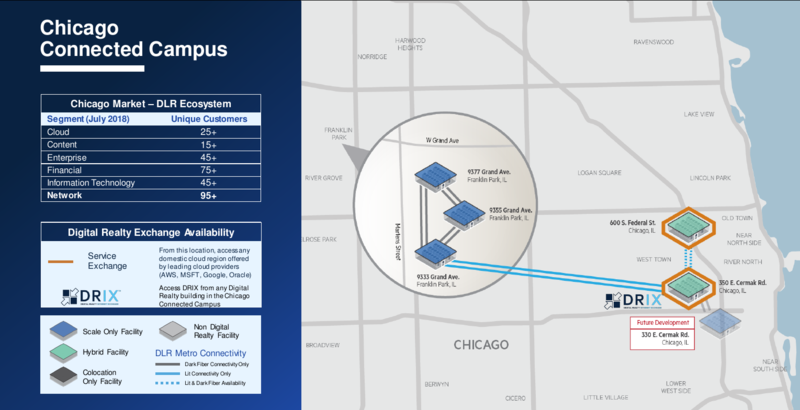 Last week, Digital Reality Trust announced an expansion of the Digital Realty Internet Exchange Platform, or DRIX, into its data centers in Ashburn, Virgina, and Chicago, bringing the number of cities where the company's internet exchange is present to six. DRIX, which Digital Reality acquired nearly four years ago in its $1.9 billion takeover of colocation provider Telx, has been available in New York Atlanta, Dallas, and Phoenix. Peering exchanges like DRIX offer network connections using predetermined routes and are attractive to carriers, cloud service providers, digital media companies, and the like, who see them as cheaper and more flexible alternatives to expensive direct connections. A media outlet, for example, might use an exchange such as DRIX to connect to content providers, while a wireless carrier might use one as a fast and reliable way to serve content from social media sites. Although peering networks like DRIX are common in data center colocation facilities, there are a few things about DRIX that separate it from the crowd. 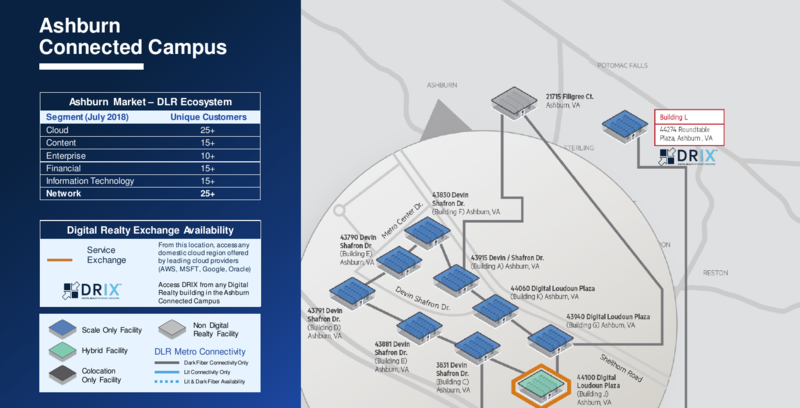 "Contrary to what some of our competitors are doing, we're keeping these exchanges as local connectivity points rather than connecting these together across the region," Fabienne Adam, Digital Realty's senior director of global product management and interconnection, told Data Center Knowledge. "As such, it is really a grassroots effort to build up these exchanges, by getting the relevant players that create value for each other on the exchange. These are the conversations that we're currently having that we're receiving good feedback on." Because at each new location DRIX starts life anew, each location's characteristics become unique to the local market. According to Adam, this aspect is magnified by the diversity of Digital Realty's customers. The company does business in both retail colocation and wholesale space, which means its customers run the gamut, from relatively small businesses using a single cabinet of IT to large enterprises and hyperscalers with multi-megawatt deployments. "That gives us a very unique customer base," she said. "Enabling this customer base to peer in the most efficient manner and interconnect with other participants that are in this ecosystem within Digital Realty is really one of the big benefits that adds to the value of Digital Realty Internet Exchange." Last week's expansion brings DRIX availability to five data centers in the Chicago area and 11 in the all-important Ashburn market. "When looking at markets where could we could extend this capability to give this benefit to our customers, the Ashburn market, which is one of the biggest data center markets ... really stood out," Adam said. As did Chicago, "specifically, our data center at 350 Cermak." Another fact that likely influenced the decision to expand into Chicago was the major footprint expansion Digital is planning in the Windy City. The company has plans to build a new 12-story, 660,000 square foot facility next door to 350 Cermak.